As I am off to BlogHer in the morning I thought this would be the perfect opportunity to host a guest blogger. Being just 8, this is DinoBoy's first ever blog post. He's just like me in his love of reading and he is mainly to be found with his nose in a book (dinosaurs or his other true love Dr Who usually). When I heard that Ebury were looking for people to review the new Torchwood books I put him forward. I love Torchwood and Dr Who so I was really excited when my mum told me that I was going to get sent a free book to read. no one has ever sent me a free book before! An amazing book deserves an amazing report. Bay of the Dead was exciting, thrilling and fantastic all at the same time. I have to admit that it was a little bit scary sometimes too - so it probably isn't for children younger than me. I would recommend that if you are Torchwood or Dr Who fan then you really should go out any buy it. I would like to read the rest of the Torchwood books now - so if that nice lady would like to send me some more I promise to read more and play less computer games. Well that wraps it up. A very big thanks to my little fella. I thought that you might all enjoy this pic of him dressed as Dr Who. We had his suit made in Thailand and he wore it to death. I sent it to the kids Dr Who mag and they featured him as best Dr Who look alike! We think that DinoBoy is far better looking! Brilliant book review. Makes me want to read it! Oh my, what a fab review Dino. I hope you get sent more books too because you're good at this and you deserve it. In fact I'm going to review your review on Stumble Upon. (Ask your Mum what that means.) Torchwood and Doctor Who rock! Great post Dino Boy ... when's the next one coming? I've never heard of Torchwood (guessing a TV programme? I dont watch much TV!) but the book sounds great! wow Dinoboy, what a fab review, my 8yo son loved reading this! Torchwood is fab, you've inspired my son to start reading more books! he said he wishes he could write as well as you also! also, you rock the Dr Who look! my 6yo son has a Human Dalek outfit which was made jusut for him! you two would look good together!! Great review DinoBoy, and very fancy suit! 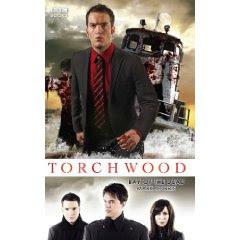 I like Doctor Who but I have not seen much Torchwood. I love reading though so I might try the books!